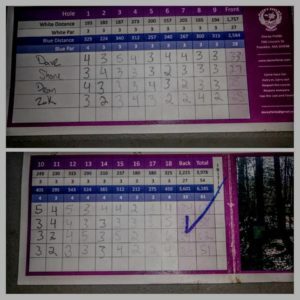 Both the course singles and doubles records were broken nearly within a month of each other during our weekly leagues! On 8/6 during our Tuesday singles league, Team Dacey Owl Zak Benson put up a scorching -10 51, besting the prior record of 52. Zak’s record setting 51, and that is with 2 bogeys! Then a little over a month later Dacey ran a Bring Your Own Partner doubles event in place of our regular Sunday Random Dubs, which saw 23 teams show up including nearly the entire Borderland Bombers roster (thanks for rolling so deep!). Teams representing The Team Borderland, The Bombers, The Billygoats, The Owls, and the newest regional team the Dacey 2 Ents were in attendance. With so many strong teams in the mix, we were thinking we would get to see the course doubles record set by Mike Hladick and Sam Henderson of 48 (-13) fall. Ultimately, it did. 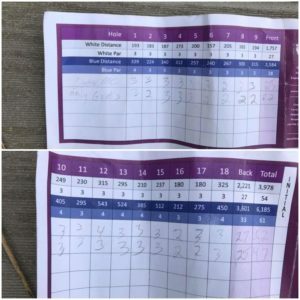 Pete Violet and Joe Mercieri of the Borderland Billygoats put up a sizzling 14 under par 47 to set a new doubles record, the first time that record has changed hands since 2016. Goats putting a clean card with a record setting score! Both scores have been updated in the Course Record Book, where you can view our current records as well as our record of recorded aces. Do note that records are only valid during events. With a Pro Tour stop taking place at close by Maple Hill, Dacey has been able to get a few pros to come out and hold clinics the past few seasons while they are staying locally. This year we welcomed Drew Gibson to Dacey where he held a pre league clinic and showed us just how far he can throw his putter (far) and ran his demonstration in a question and answer format where he took many direct questions from the crowd. Drew explaining the mechanics of his world renowned power. Philo Brathwaite also returned to Dacey to run a small clinic a few days after Drew, it was Philo’s second time at the course. 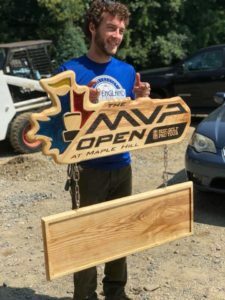 Speaking of the Pro Tour, Team Dacey Ent member Zack Pepin got an artistic break when he was commissioned to create the trophy for the MVP Open that ultimately James Conrad would lift. Zack’s wood burning talents are unparalleled, and we are super stoked to see him get a breakthrough! This will be hoisted by future champions of the MVP open, and their names will be placed on the board below to commemorate each champion! Team Dacey Owl Scott Groome’s talents have also been recognized! Along with his stunning paintings he has done for a number of locals, Scott’s art will be flying through the air in the not so distant future. Scott designed the stamp for the 2018 Dacey Feathers of the Fall event on October 14th, and in addition to adorning some local plastic Scott has been working with some touring pros on designing some stamps for them, too! Scott is also the graphic designer for Marshall Street. 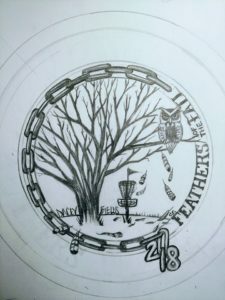 Things are coming together for our resident artists, and we are extremely proud of their skills and hope that they both keep getting bigger and bigger in the disc golf scene! As summer winds down, we are gearing up a successful fall and winter! Starting off with registration is now open for the Feathers of the Fall on 10/14! Click here to register! This event is sponsored by Prodigy Discs and Everything Discs in Norfolk. It will be a fun day! Do keep in mind that Saturdays in the fall means Soccer. Please be courteous to other park users and represent the community and sport in a respectable manner. Avoid the course early in the day, and please carpool where possible. Also to keep on your radars- fall means Team Challenge is right around the corner. With two teams at Dacey now, there will be a number of dates where we will have ~40 people on the course for matches. We will have the schedule posted on the kiosk!